COLUMBIA, SOUTH CAROLINA – Continuing a tradition that began during the 2009 holiday season, Callison Tighe & Robinson has donated $10,000 to Harvest Hope Food Bank. This contribution brings Callison Tighe’s total over the years to $97,500 to Harvest Hope. The non-profit that helps more than 2 million people a year in 20 South Carolina counties. Callison Tighe partner Rick Detwiler and other firm representatives were on hand Thursday morning to present the check during an all-day food drive and live telecast on WACH TV. In Richland County alone, nearly 800,000 people struggle with hunger – that’s nearly 20 percent of the population, Detwiler said. In some counties Harvest Hope serves, the child hunger rate is as high as 32 percent. Harvest Hope volunteers have heard stories of children having sugar water for dinner. 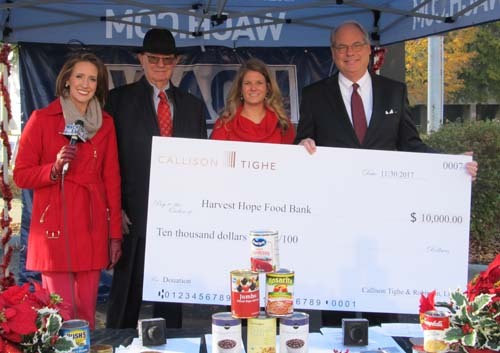 Callison Tighe made its first contribution to Harvest Hope as the state and the nation recovered from the Great Recession. Though most donations have been during the holidays, Callison Tighe also has stepped up during severe summer shortages and after 2015’s devastating flood. The firm has helped Harvest Hope in other ways too, donating a pickup truck to transport donations and packing food boxes for distribution. Founded in 1981 in Columbia, Harvest Hope now partners with 476 non-profit agencies in 20 counties. The food bank feeds about 48,000 people a week, distributing around 28 million meals annually. Harvest Hope operates mobile food banks that serve those with transportation issues. It also serves as South Carolina’s primary emergency hunger relief organization, ready to mobilize if a disaster strikes. The need is even more crucial during the holidays. Harvest Hope needs donations of non-perishable food and supplies and is asking businesses, churches and schools to sponsor food drives. Individuals can donate directly to the organization or through holiday box purchases and register drives at retail grocers. To learn more, visit harvesthope.org or call (803) 254-4432.